I don't normally use this blog for anything other than picture-book based philosophical discussions. This entry, on the occasion of the death of Oliver Sacks, is an exception. Today, six months after his beautiful, invigorating piece in the NYT announcing his terminal illness, Oliver Sacks has died. I've read most of Sacks's published work and I have to say I have found few people as contagious in their enthusiasm as he was. He was so fascinated that he was fascinating. This summer I read On the Move. A Life. Some people are inspiring by speaking about what they do and why they do it, rather by trying to tell others what to do. Oliver Sacks was one of them. I love his talent for inspiring curiosity and inquiring passion through narrative. Isn't that what education should be about? Not only about inspiring children but about inspiring them to inspire others; making them aware that their own curiosity and passion has the power to spark it in fellow students, seniors and juniors and giving them the tools and opportunity to narrate their curiosity and passion in ways that do just that. I love Sacks' way of constructing connections and celebrating tangential, tentative, sometimes seemingly lunatic connections. The fun of connecting one idea with another idea, one's experience with one's ideas and the ideas or experiences of others. The thrill of discovering or inventing connections. Whenever I read anything by Sacks, I find myself desperately needing to get my hands on every single book he mentions, including books about things I know absolutely nothing about and had never even thought about before. And constantly asking myself how much more meaning one could pack into a single life. Back in February, in his piece for the New York Times where he announced he only had a few months left to live, Sacks said: 'I have to live in the richest, deepest, most productive way I can'. But unlike many who learn of their imminent death, this wasn't a resolution to change, but a hope for continuity. 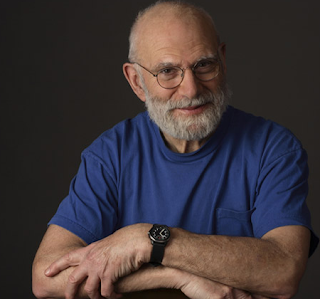 Oliver Sacks exemplified the meaning of life and then exited beautifully. Happily, rather a lot of that meaning remains in his work. Text by Ellen Duthie. Copy or reproduce it, but please be nice and quote your source!